Minister Ze'ev Elkin tells Arutz Sheva about importance of principles, eternal phenomenon of anti-Semitism, danger of withdrawals. Immigration Absorption and Jerusalem Affairs Minister Ze'ev Elkin (Likud) toured the Gush Katif museum on Tuesday morning. While there, he spoke about reported plans to create a national unity government with the left-wing Zionist Union. "There are many versions of this story going around. It's important for us as a government to continue our policies, and let any who want join. We can't expand the government at the cost of giving up our ideology," he told Arutz Sheva. Elkin took the opportunity to launch a barb at the internal conflicts within the Zionist Union party. "Everyone in the Labor Party is currently busy killing each other. When they're free, they should make up their minds." The Minister also said he's not shocked by the anti-Semitic statements coming from the UK's Labour Party. "For some time I have been saying that there are all sorts of anti-Israeli phenomena that originate in anti-Semitism. It is politically correct form of anti-Semitism to be anti-Israeli. Now it's already become regular anti-Semitism. But there really aren't any clear lines between the two phenomena." 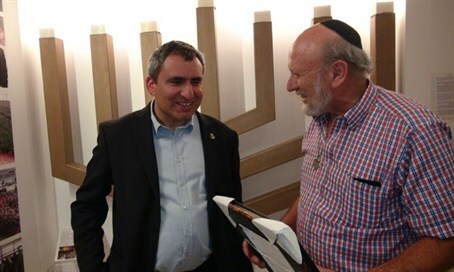 As for his visit to the Gush Katif Museum, Elkin said that the Israeli public has learned its lessons from the disengagement. "Most of the public now understands that withdrawals don't bring anything but human destruction, less security, and many more problems. I hope that we will not repeat this mistake and that we will not withdraw any more from our lands."